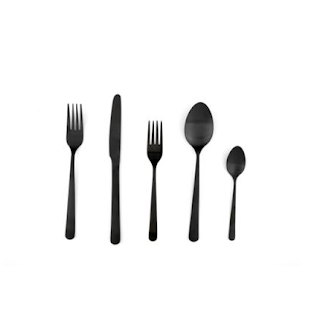 pretty.pretty.paper: do you know how long i have wanted black flatware?? oh how design within reach taunts us with its whole "within reach" that is not actually within reach concept that makes no sense. I was this close to registering at Moma (or was it Moss...?) just for the black flatware, but it turned out to have a pretty nasty coating on it. I try to avoid ingesting poison with my food. and matte finish? i'm in love. more like Design way way way out of the ball park. BUT, you know if it is there there will be cheaper knock offs soon!